Congratulations on your graduation from Grady College. We are proud to add you to our list of alumni. We hope that you are proud of the effort and achievement that your degree represents and that you feel well prepared to begin a career. Grady’s Spring Convocation honors students graduating in Spring/Summer 2019. 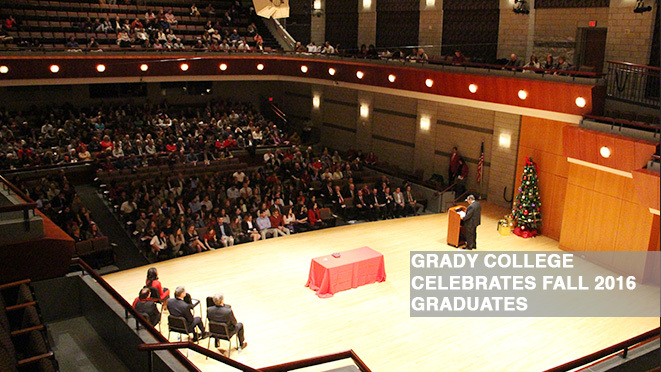 The Convocation brings students, faculty, family and friends together to celebrate Grady student achievement and to welcome graduates into the professions in journalism and mass communication. 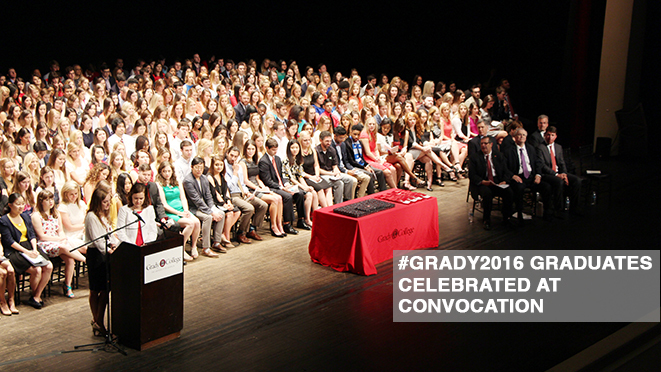 Additional Information: Questions related to the Grady College Convocation ceremony may be directed to Beth Rector at (706) 542-2526 or brector@uga.edu. Seating: Students may invite as many guests as they would like. Seating is first come, first served, and no tickets are required. Dress: Business attire. Caps and gowns are NOT worn for Convocation. Students: Check-in will be from 1:30 – 2:30 p.m. at the Classic Center (Room TBA). All students wishing to participate in the Convocation ceremony must arrive for check-in before 2:30 p.m. The University of Georgia’s Spring 2019 Commencement ceremonies will be held on Friday, May 10. The graduate ceremony will begin at 10 a.m. in Stegeman Coliseum. The undergraduate ceremony will begin at 7 p.m. in Sanford Stadium. For more information about UGA Commencement, visit commencement.uga.edu. Visit the UGA Commencement website for more graduation details. The University of Georgia’s Spring 2019 Commencement ceremonies will be held on Friday, May 10, 2019.